Need to ship pallets across Canada? We can help! We work with 100s of carriers to ship pallets and skids across Canada & our goal is to get you the best rates. We cover the main routes but also ship to smaller Canadian cities. 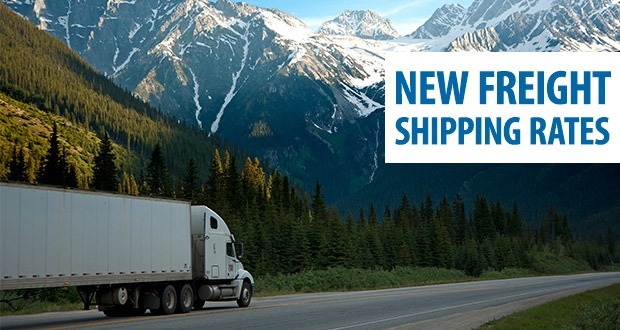 Find some example rates below, or compare best all-inclusive LTL rates and instant quotes from 100s of carriers to save 50 to 85% by signing up for FREE. Ottawa to Brockville, ON. Previously: $82.65 CAD. Now: $71.86 CAD. Vancouver to Mission, BC Previously: $101.44 CAD. Now: $89.63 CAD. If you’re new to shipping pallets, make sure you’re packing properly. Check out our infographic on how to prepare, pack, and palletize your pallets. Looking to Ship Pallet Freight? Compare multiple quotes from carriers and book instanly at Freightera. What is the cost to send a 60 lb item on a 10 lb pallet from Brockville Ontario to Comox , BC? Hi Nano, Thanks for your request. Let me have our client care respond to you. Thank you & Happy Shipping! I need to send a package 45x45x30 about 180lb from Elmvale, ON to Kelowna, BC. Are you able to do this? How much will cost and how fast? Thank you. Looking for shipping few solid wood tops around 6-7feet long and 4feet wide, also some lumber with it around 9-10 feet long. From Ottawa to Yellowknife or Edmonton. Hi Vitaly! Thanks for your inquiry. We should be able to help you. In fact, one of our logistics managers is specialist in lumber. Please contact our awesome Client Care team via online chat or phone during the week. Or email any time clientcare@freightera.com. Sorry about missing your comment until now. Hi, looking to ship a item from Toronto to Winnipeg. 21inch width 34inch depth and 60inch height? I can crate it and put it on a pallet if it helps. Weight will be under 300lbs can someone get back to me regarding this. Hi Hootan, we should be able to help, if it’s a business to business or business to customer shipment. Crating or palletizing will surely help to protect your shipment. Please ask our Client Care team via Online Chat or call if you have more questions. Hi Peter! Thanks for your inquiry :). Please check live rates at any time at https://www.freightera.com/shippers/quote?lane_type=LTL . Ask our super-friendly client care team any questions on our Live chat during work hours. We are based in Perth, ON and have a lot of shipments that go to Alberta and Calgary. What would the best rates be for a standard pallet weighing around 1000 lbs? Hi Jessica! Thank you for your inquiry! We would be happy to help you with your heavy pallets. Please check live rates on the website at any time or chat with our client care team on our Live chat, email or call us. Hi, I am in strathmore Alberta and wish to send household items to Victoria. It would be around 500 lb. How much will it cost to me? At this point, we don’t serve personal shippers. We only provide transportation services to businesses, manufacturers and distributors. Writing up a guide for gov’t. which is to provide ton-mile or kg-km approximation trucking freight costs based upon truckload shipments between major points in Canada & from U.S. points to Canadian cities— all based on mile or kilometre distance between points. Some by weight & some by volumetric weight, but all assumed truckload shipments. Might you offer guidance?